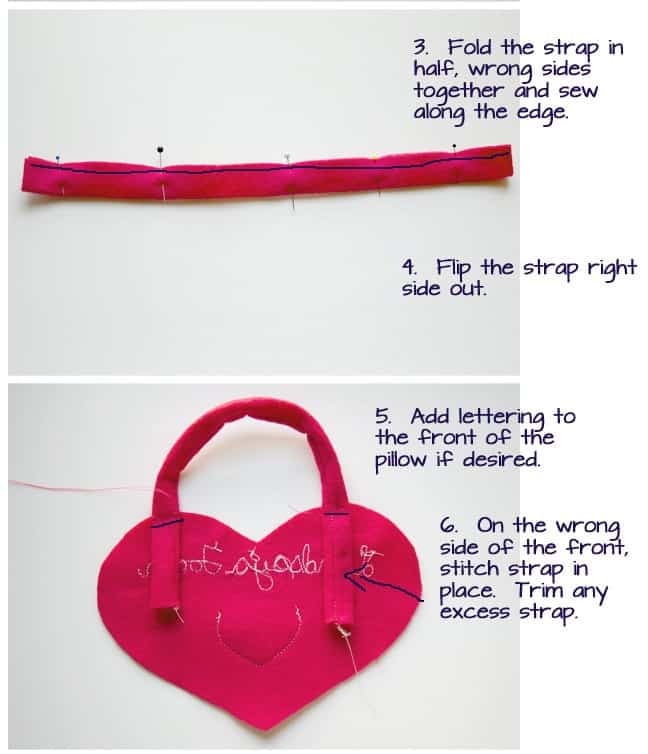 Easy Tooth Fairy Pillow Tutorial. 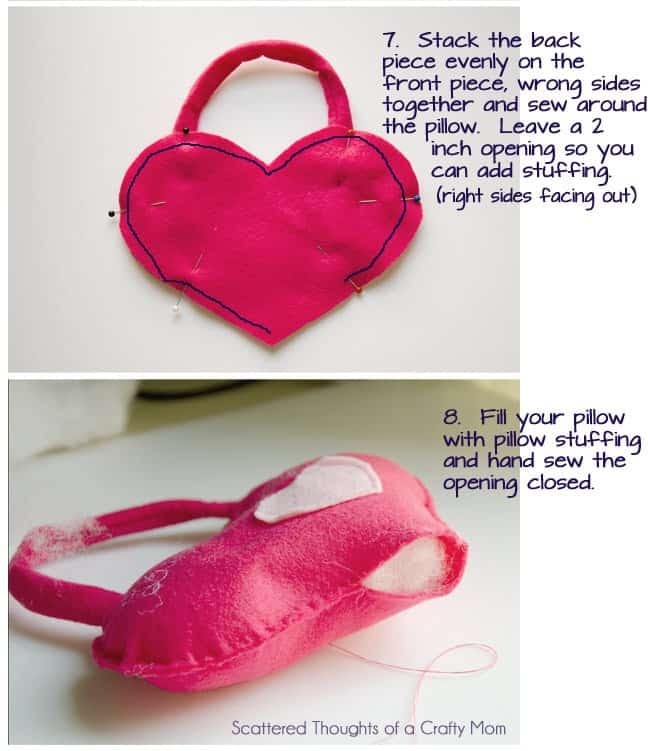 (How to make a Tooth Fairy Pillow) Any little girl would be thrilled to have this DIY Heart Shaped Tooth Fairy Pillow – and you’ll love how easy it is to make! In my last post, I mentioned that my daughter had lost her first tooth. I didn’t even realize it was loose until last week when she was at Grandma’s and they called me to announce that she had a loose tooth! I knew I better get to work making her a Tooth Fairy Pillow so it would be ready when she lost her tooth! This pillow is so easy! You don’t even need a sewing machine. 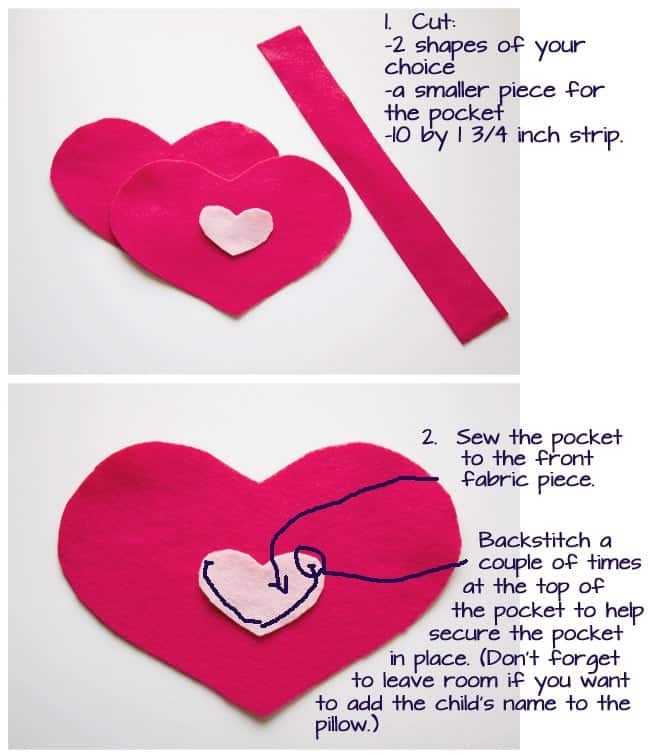 The materials used and the fact it is such a small project, it can be hand sewn in a jiffy. I can attest to this because my sewing machine broke right after I stitched the words on the front- so the only thing machine sewn, is her name and the pocket. 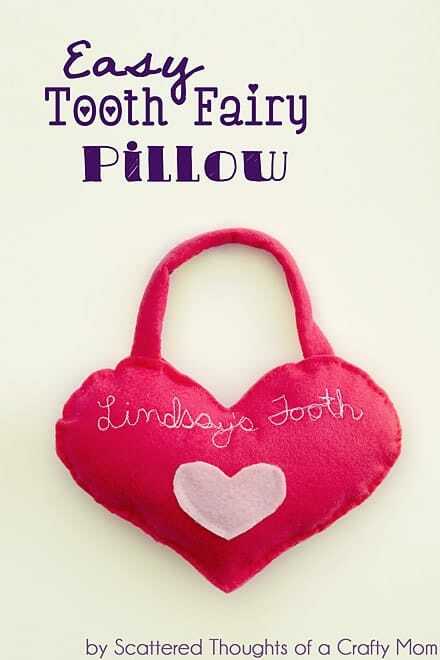 If you want to make a tooth pillow for your little one, you have tons of options. I used felt to make this pillow. It is a great choice for this type of project. Craft stores sell many different colors of felt in 8 1/2 x 11 inch sheets for around 99 cents. The great thing about felt is that it doesn’t fray, so there’s no need to finish the edges! You can make any shape you want: heart, rectangle, square, monster or even tooth shaped. The instructions will be the same. 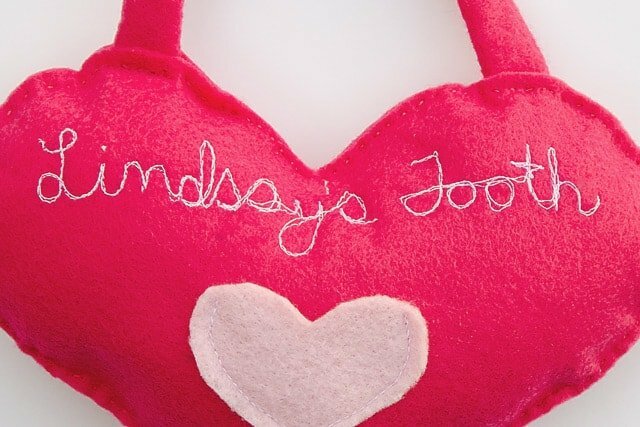 If you want to add your child’s name to the front, you could free motion the name like I did with a free motion foot, hand or machine embroider, stencil, paint or even use a Sharpie. It’s up to you! I only have one recommendation if you are hand sewing your pillow. You could cut the strap either 5/8 inch wide and not fold it in half or cut it 1 1/4 inch wide stitch along the side but not flip it inside out- just leave the stitches showing. That’s all there is to the pillow! Now, I am starting to get quite a little collection of teeth. Other than the 1st tooth lost, what does everyone do with the teeth? Do you just throw them away? What a cute idea! I love that it's something different and fun for the tooth fairy to find! Hah, I saw this on Pinterest before I found it in my feed, and at first, I had to scratch my head, because when the pic is little, it looks like "Limbaugh's Tooth". And I was wondering what kind of ultra-conservative family names the TF after Rush?? Oh, the weird brain circles I was making! Super cute! My daughter has lost 3 teeth and doesn't want to do the tooth fairy thing at all. I told her to ask the tooth fairy to keep her teeth and she wants nothing of it. 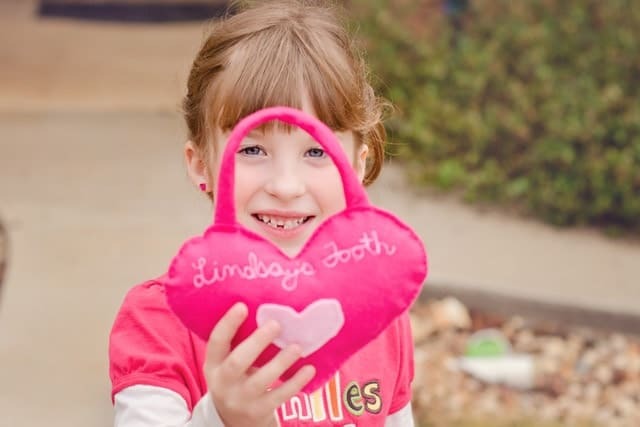 Too funny – I was JUST talking to my husband yesterday how I had a tooth fairy pillow that I hung on my doorknob when I was growing up and how I wanted to make one for our son. It makes it just sounds sooo much easier when making the coin-tooth swap. Love it!! These are great, my kids have had one since they were little. Now that they have lost all of their baby teeth they are just collecting dust in their Baby Boxes. I am a new follower! I found your link on Flamingo Toes. I would love for you to link up to my weekly linky party Fluster Muster on Wednesday’s @ http://www.FlusterBuster.com. So cute! Thanks for sharing. I pinned it for future reference. No teeth lost in our home yet, but I'm sure it won't be too long. Very sweet – and your daughter looks thrilled with it! Hi, great post. I found you through the blog hop. Please stop by and say hi when you get a chance. .Be sure and check out my new Blog Hop that started. It's Weekly Goals Link Up. It's a great way to stay on track. Have a great day. 🙂 Now following you. Here's the link for it if you would like to check it out. So lovely!!! Love the color too! Thanks so much for sharing the great tutorial! Would love to have you visit me sometime. Such a cute idea! 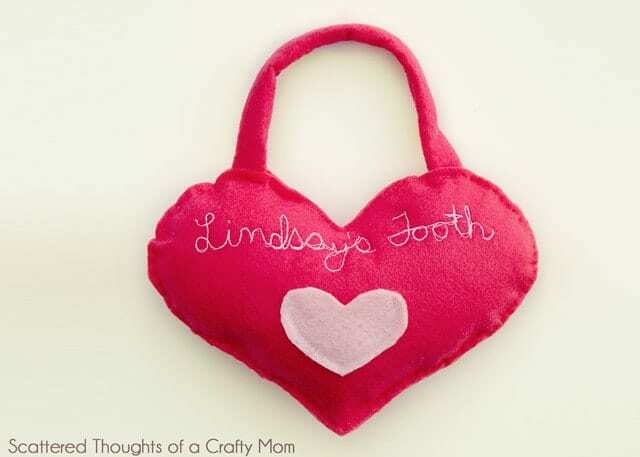 My girls are to young to be losing teeth yet, but once they start I have a great project in mind! Love your whole blog too,am following on GFC, Twitter and Facebook. Would love to have you visit our little piece of the internet sometime and follow us back! My daughter is 6 1/2 and hasn't lost a tooth yet. Let's just say she's not so happy about it! I'm definitely going to make her one of these. So stinking cute! What a great project!! Thank you for sharing at Sharing Saturday!! Too cute – almost makes me want to lose a tooth!